WHAT’S ON THE OTHER SIDE OF YOUR WINDOW? Many hotels use some wonderful Curtain-Tracks products to create an oasis for their guests. The star of the show is obviously the eclipse curtains. They come in all kinds of great colors and patterns and do an outstanding job of keeping out unwanted light and noise. In addition to great curtains, however, great hardware is necessary as well. The 84004 track along with 84100 ball bearing carriers help ensure that the eclipse fabric is secured and easy to open and close. This track is made from aluminum and the carriers have metal bearings inside, so they glide with ease. This is important since most hotel rooms have tall ceilings that are difficult to reach if the carriers get stuck on the track. Plus, curtains that get stuck don’t exactly conjure the image of class and luxury that most hotels are aiming for. The last piece of hardware that is necessary for a project like this and puts the finishing touch on an already great system are our wands. They not only make opening and closing curtains a breeze, they allow for an overlap of fabric to keep out every. last. bit. of light. 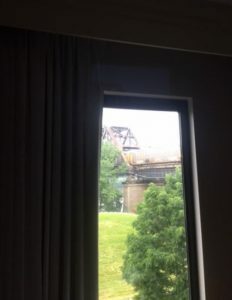 This small difference between an average curtain track and Curtain-Tracks is the difference between being woken by a sliver of sun in your eye and sleeping well into the morning hours. WHAT DOES A HOTEL HAVE TO DO WITH ME? If our products, like our tracks and black out curtains, work well in a hotel’s sometimes less than ideal location, just imagine how they can help your home feel more like an oasis! Can your home benefit from a product used by luxury hotels?